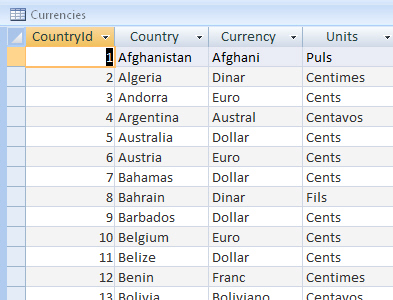 Create a new Access database called Countries and Currencies (or if you prefer you can import data into an existing database). Make any necessary changes to the worksheets in this Excel file so that they will both be importable (be careful to check there aren't any gaps ...). Close down your database, saving any changes.